A Florida man in his 60s has sued Apple, alleging that he was denied promotions when he worked at the company's retail store because of his age. Michael Katz has accused Apple of violating the state's Civil Rights Act, as he believes he was subjected to discrimination based on his age. The complaint, filed this week, seeks damages in excess of $15,000. Katz began working as a Mac specialist at the Apple store at Millennia Mall in Orlando in March 2006, when he was 60 years old. In his lawsuit, he says he expressed his desire to be promoted to the title of "Creative." In his tenure at the Apple store, there were "several" openings for creatives at the store, and Katz claims he applied each time but was denied the position. Those who were selected for the job were at least 15 years younger than him, he said. "Katz was passed over for promotion multiple times in favor of individuals with less seniority with Apple and inferior qualifications," the complaint reads. "Katz was not provided with any explanation for his repeated denail of promotion opportunities. Rather, his supervisor simply denied that Katz had ever expressed a desire to obtain a Creative position." Katz was "constructively terminated" from the Orlando store in September 2007, and he filed charges of discrimination with the Equal Employment Opportunity Commission and Florida Commission on Human Relations. 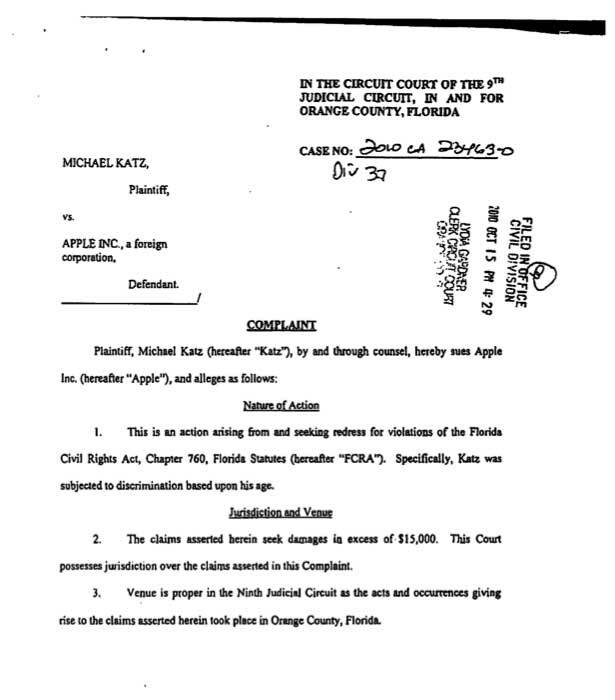 In June 2009, the EEOC reportedly found "reasonable cause" that Katz was denied promotions by Apple because of his age. "The EEOC attempted to conciliate the matter, but those efforts failed," the complaint reads. It also notes that the FCHR did not issue a determination on his case. "Katz's FCRA claims are therefore ripe for litigation, and he is permitted, pursuant to Florida Statute 760.07 to file a civil action in this Court seeking a remedy for the unlawful employment practices described herein," it states. The suit was filed in the 9th Judiial Circuit Court in Orange County, Florida, where the Orlando store is located. Katz is seeking back pay and and damages from the Cupertino, Calif., company.